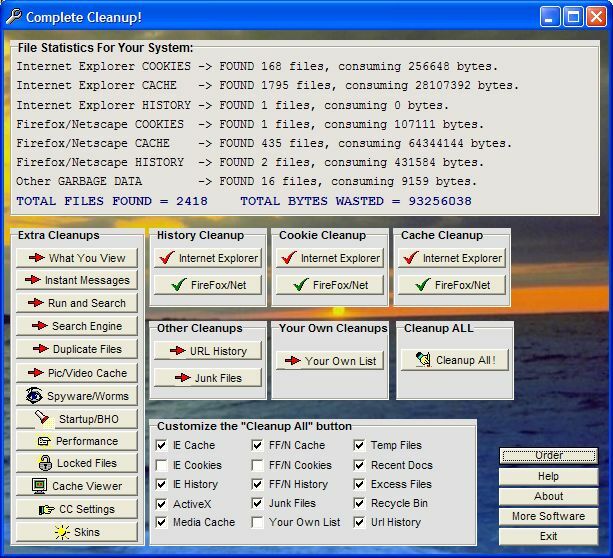 Complete Cleanup displays all your file statistics, improves pc performance, and cleans up all cookies, cache files, history files, ActiveX controls and java applets, search engine data and auto forms data, previous passwords, index.dat files, BHO objects, and location URLs for all versions of IE, Firefox, Netscape, and AOL. This also has many other disk cleanups including duplicate files, and has a spyware review and cleanup option. Protect your internet privacy and clean up the garbage on your pc. ...... index.dat files, MRU's, and location URLs for all versions of IE, Netscape, AOL, Firefox, and MSN Explorer. This includes a free spyware system review from an actual programmer, and spyware cleanup if necessary. This also allows you to scan and find all duplicate files, and performs many other disk cleanups, including your recent documents list, temp files, system startup list, various registry entries, BHO browser objects and rogue startup programs, along with the ability for secure file wiping, so the cleaned files cannot be recovered at a later time. OEComplete is a complete utility for managing your appointments and tasks. Word Autocompleter, Shorthand Expander, Productivity Tools. Chord ID, Pitch ID, Rhythm ID, and Spell ID are all in one. Scan, detect, and fix errors in your computer registry errors. It allows you to ping one ore more IP addresses. PHP Menu For Web Pages, And Search Engines Will Follow All Menu Links! T-Minus New Home Completed Countdown Clock. Count down the days. The complete guide for planning and optimizing your Pay-per-Click campaigns. Qweas is providing links to Complete Cleanup 5.14 as a courtesy, and makes no representations regarding Complete Cleanup or any other applications or any information related thereto. Any questions, complaints or claims regarding this application Complete Cleanup 5.14 must be directed to the appropriate software vendor. You may click the publisher link of Complete Cleanup on the top of this page to get more details about the vendor.